Abu Qatada. [Source: Reuters]British police raid the house of radical London imam Abu Qatada and find the equivalent of $250,000 in cash under his bed. Abu Qatada claims that the money is for the construction of a new mosque. 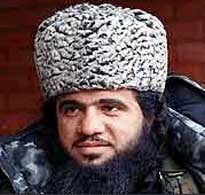 However, $1,174 is in an envelope marked “for the Mujaheddin in Chechnya.” [BBC, 8/11/2005] At the time, Qatada has no money-making job and is living with a wife and four children on government benefits worth $150 a week plus other housing aid. [New York Times, 10/26/2002] Spanish intelligence has known for years that al-Qaeda leader Barakat Yarkas has been frequently traveling to London and giving Qatada money for Chechnya that was raised in Spain (see 1995-February 2001). It is not known it the Spanish shared this intelligence with the British. Authors Sean O’Niell and Daniel McGrory will later write, “Jihad supporters have since confirmed that Abu Qatada was known throughout Britain as a conduit for funds destined for the Chechen fighters. Some of that money had been raised—directly and indirectly—in British mosques. There were straightforward appeals for the Chechen struggle, and rather more opaque pleas for charitable donations which were then siphoned off to the militants.” [O'Neill and McGrory, 2006, pp. 67-8] Abu Qatada has a relationship with British counterintelligence (see June 1996-February 1997 and Early December 2001).